Accordin g to the National Oceanic and Atmospheric Administration, 2017 may set a new record for being the most expensive year for disasters. 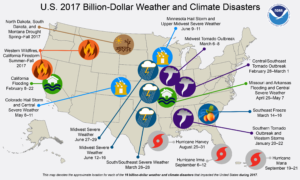 Hurricanes Harvey, Irma and Maria combined with devastating Western wildfires and other localized natural disasters caused $306 billion in total damage in 2017, with 16 separate events that caused more than $1 billion in damage each. The record-breaking year raises concerns about the effects of future natural disasters, as scientists fear climate change could make extreme weather events more damaging. This is especially concerning to Texas which pays the most out of all U.S. states on events like hurricanes, tornadoes, forest fires and many other natural threats according to a leading climate scientist Katharine Hayhoe from Texas Tech University. There have been 91 disasters in Texas costing more than a billion dollars since 1980. Hurricane Harvey, which sparked extreme flooding in Houston and the surrounding area in August and September, is estimated to have caused $125 billion in damage, the year’s most expensive disaster. 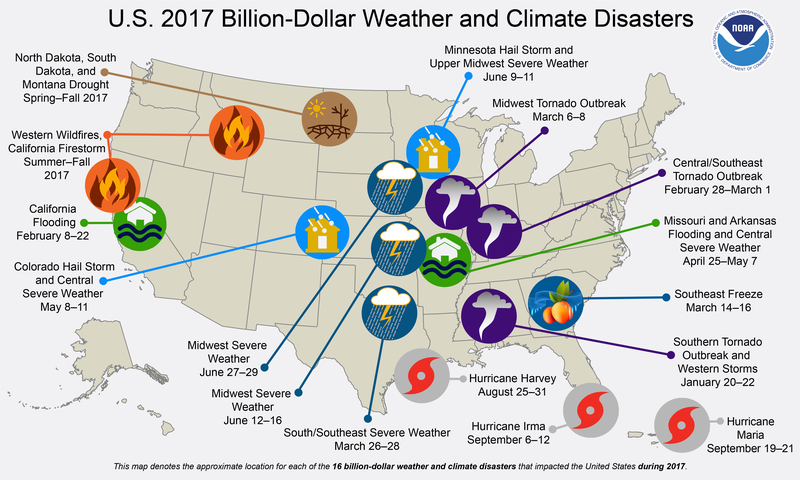 One key question is to what extent climate change may be driving the U.S. toward more numerous or more severe disasters. NOAA experts and other climate scientists generally demur on this question, reluctant to apportion how much of the damage could be attributed to a changing climate as opposed to other factors. One key factor also known to be worsening damage is that there is more valuable infrastructure, such as homes and businesses, in harm’s way — along coastlines or in areas vulnerable to wildfire. Since the population in Texas is expected to nearly double by 2070, one should assume that the infrastructure in vulnerable areas will also increase, meaning the cost of extreme weather disasters to the state will continue to climb. In the coming year, climate advocates such as ourselves will need to continue to combat the ignorance, misconceptions, and downright falsities that plague climate activism. We are increasingly encouraged to find local communities taking the lead in this battle. Austin has already passed a climate action plan. San Antonio, Dallas and Houston are in the process of developing similar plans. These are large metropolitan areas, but smaller cities and towns can take similar actions. Below are actions you, your business and community can take to mitigate climate change. We encourage you implement what you can, and we will continue to update you on what is happening in the state and in local communities. Climate change is a dangerous threat to our communities, but the solutions are ripe with opportunity. Climate change is a problem that will require policy changes. Voting and letting elected officials know that you support climate-friendly policies is critically important. Policy changes at all levels and types of government are needed. Pay attention and participate in decisions at your school district, city, county, state government and federal government. Do your research on political candidates – even those in down-ballot races – before going to the voting booth to make sure you are casting educated votes. Many of the solutions below will be most effective with comprehensive policies to support them. Setting goals for greenhouse gas emissions reductions and developing a community climate action plan can provide an organized roadmap of actions to take as a community and as individuals. A community climate plan should begin by conducting a full greenhouse gas emissions inventory. The process should be open and driven by public participation. Reduce the amount of energy it takes to heat and cool buildings by sealing cracks, adding insulation, sealing ducts, and replacing old air conditioning units. Use programmable thermostats to reduce energy waste while buildings are unoccupied. Co-benefits: Electricity bills will be reduced and comfort improved. Local jobs can be created. Government: Adopt and enforce the 2015 Energy Code. Retrofit government facilities. Adopt Property Assessed Clean Energy (PACE) to allow commercial customers to finance energy and water efficiency and renewable energy investments. Homeowners: When purchasing a home, get an energy audit before closing. Get energy audits for existing homes. Utilize incentives from your electric utility to make efficiency upgrades. Businesses: Do a full cost/benefit analysis of making energy efficiency improvements. Consider utilizing the Property Assessed Clean Energy (PACE) program to finance energy efficiency upgrades. Purchase renewable energy for government buildings, homes and businesses. Co-benefit: Fixed price contracts for wind and solar can protect against future energy price increases. Local jobs can be created. Government: Buy or contract for wind and solar energy to power government facilities. Create community solar and solar group purchasing programs for residents. Homeowners: Get a solar energy system installed at your home. Get at least three quotes and inquire about financing options. Or participate in community solar, where available. Businesses: Get solar installed on unused roof space or on parking shelters. Consider utilizing the Property Assessed Clean Energy (PACE) program to finance on-site solar. Reduce vehicle miles driven by utilizing public transportation, and transition to electric vehicles. Co-benefits: Public transportation increases mobility for low-income residents and reduces transportation costs. Electric vehicles eliminate local air pollution and are cheaper to maintain and operate. Government: Fund public transportation (rail and busses). Transition your vehicle fleet to all-electric. Even electric heavy vehicles, such as garbage trucks, are becoming available. Make car chargers (including rapid chargers) available in public parking spaces. Residents: Utilize public transportation, car-pooling, bicycles and walking whenever possible. Purchase an electric vehicle. Businesses: Transition company fleets to electric vehicles. Provide electric vehicle charging for your employees and customers. Create a company car-pool program and incentivize employees to use it. Reduce the amount of waste that goes into landfills. Composting keeps organic materials out of landfills, where they create methane – a powerful greenhouse gas. Recycling reduces the need for raw materials, which have a carbon footprint. Co-benefits: Reduce the need for new landfills, which are unpopular in any community. Compost is a valuable fertilizer for lawns, gardens and farms. Government: Establish a goal for reducing the amount of waste sent to landfills. Establish curbside recycling and composting programs, as well as drop-off locations. Provide recycling and composting receptacles wherever there are trash cans. Residents: Utilize city composting, create or buy a backyard composter or utilize community composting at local community gardens. Recycle everything you can. Avoid buying disposable products and products with packaging that can’t be recycled. Businesses: Provide recycling receptacles wherever there are trash cans. In restaurants, provide composting in the kitchen, and also for customers to use, if customers bus their own tables. Phase out products and packaging that are difficult or impossible to recycle. In restaurants, replace plastic straws, utensils and dishes with compostable products (or at least recyclable products).